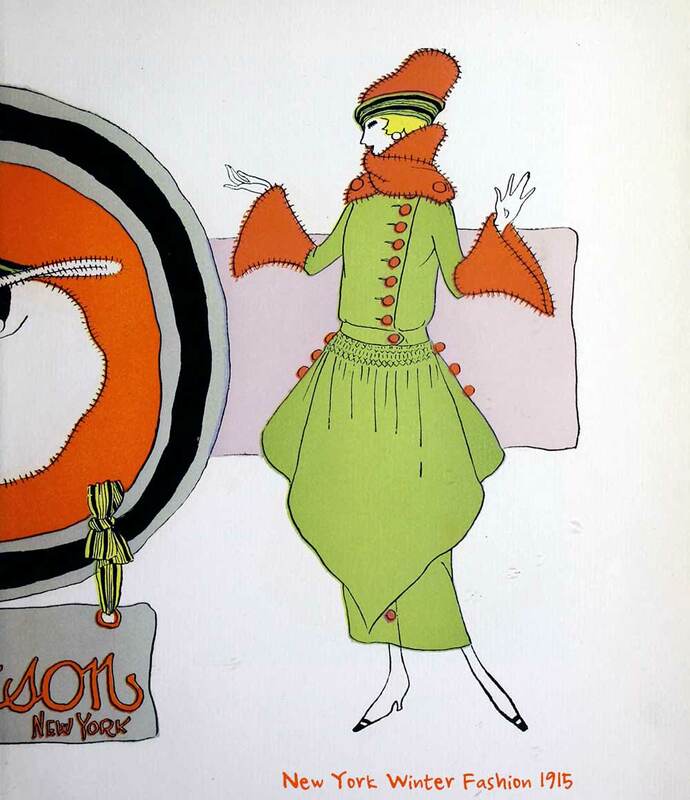 This beautifully illustrated booklet was shown at the Panama Pacific international exposition in San Francisco in 1915. 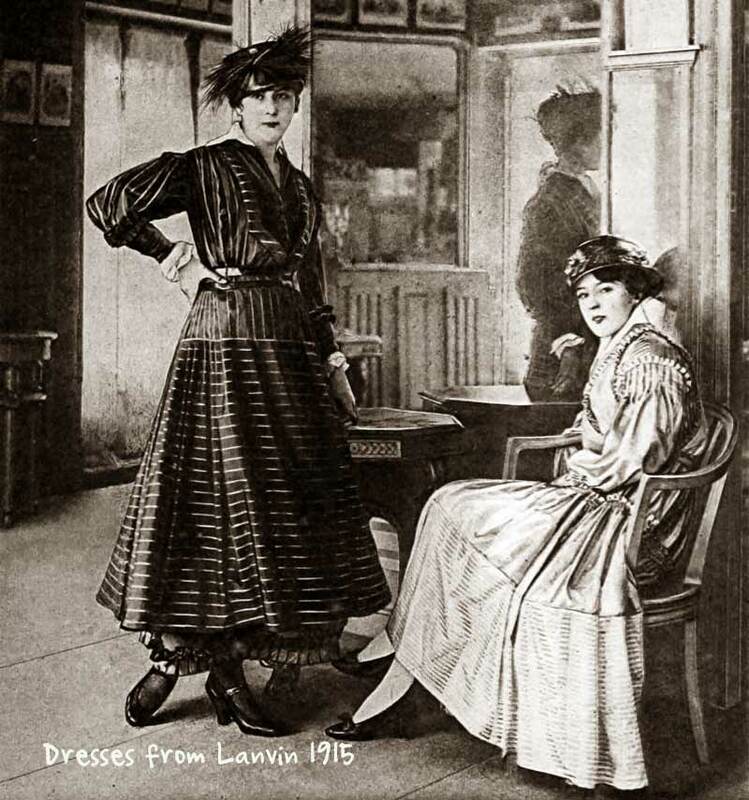 The big names in 1910’s Paris fashion are Lanvin, Callot, Paquin, Beer and Doeuillet. 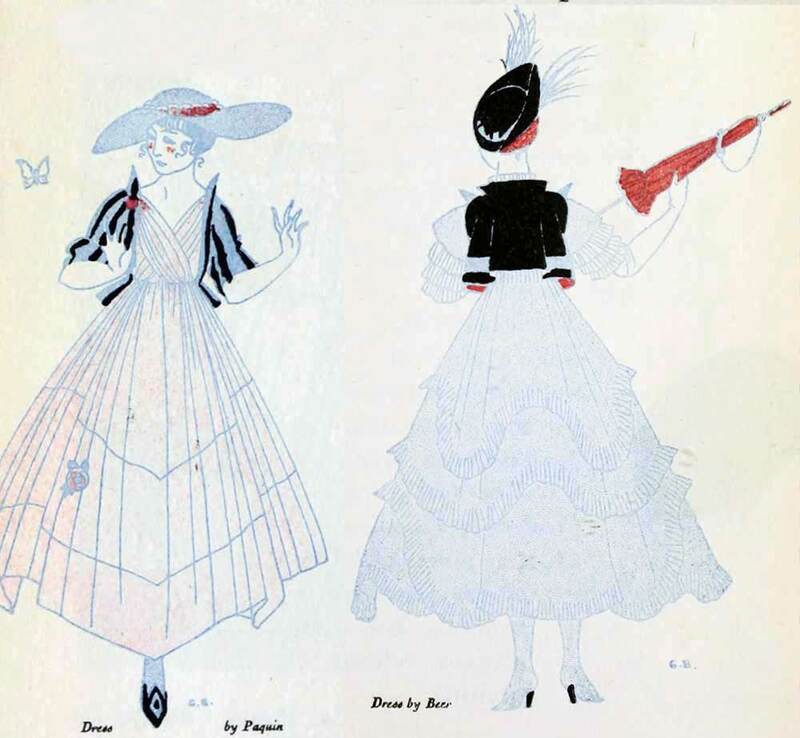 The 1915 Paris Mode can be seen in full on the Internet Archive. 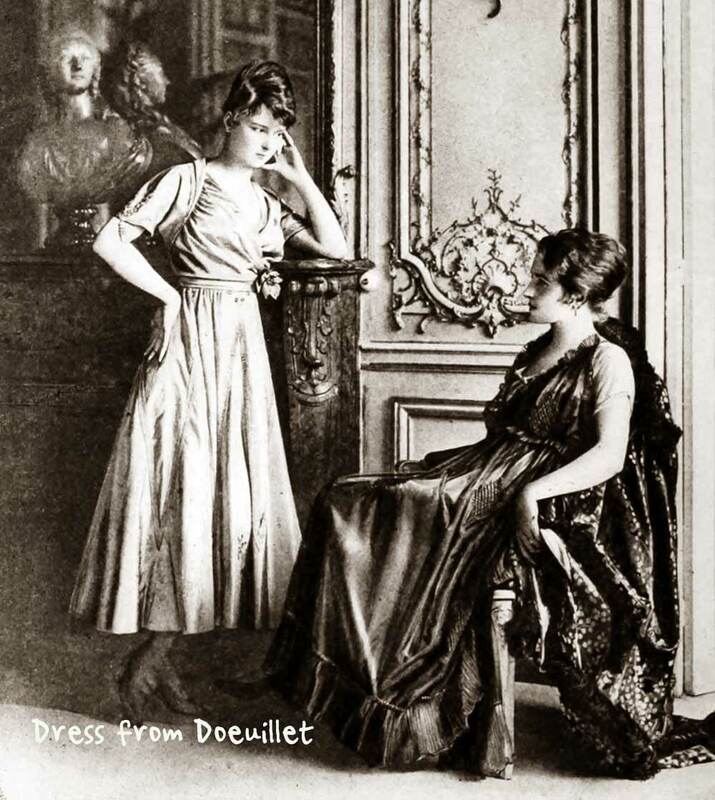 It would be a great mistake to suppose that this terrible time of war has paralyzed the creations of French fashion. 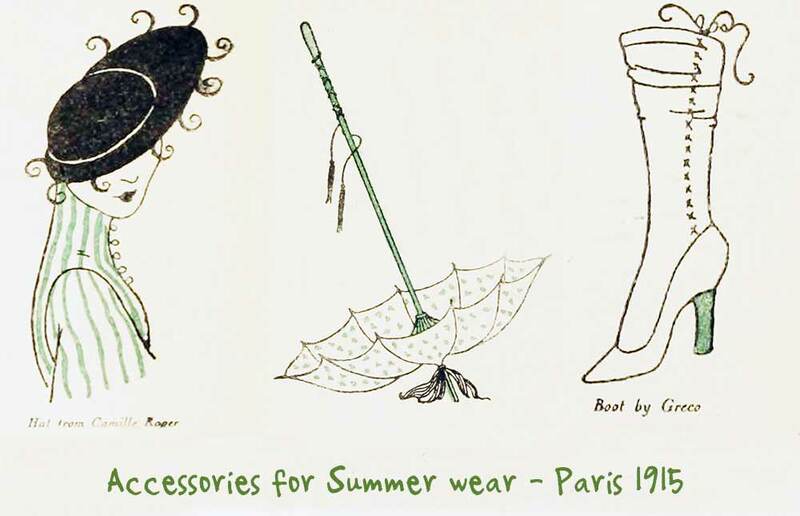 If, as is natural, Paris has been obliged to give up the elegance of life, for an existence of retirement and devotion, foreigners at least continue to ask France for advice and guidance in taste and fashion. The exhibition of San Francisco has been the occasion of a fresh impetus. In a time of women taking the place of the men in the factories, it still appears that a desire to be womanly, has seized upon ladies. Though women did appear to the world as “women before the catastrophe” they now wish to re-enter into the spirit of feminine intelligence and devotion to beauty. A lady exhausted by winter passed in daily duty in hospitals and munitions factories, will show her state of mind in her simple, daringly short muslin dress. In these small details we are seeing the new “women after the war” who will emerge. The lady and the dressmaker, in perfect understanding have contrived to identify the garment with the wearer, and it will charm our hours of lazy reverie this summer, to watch the pretty women of France when they pass by the cafes of Paris, in dresses of plain silk, scarcely gathered over the hips and waving lightly from her ankles. They shall still run their busy lives, but in figures uncompressed, allowing to easily bend over suffering men to offer help and feminine comfort. We shall feel also that they have made themselves look as pretty as they could, so as to bring light and cheer, leaving a trail of beauty wherever they pass. 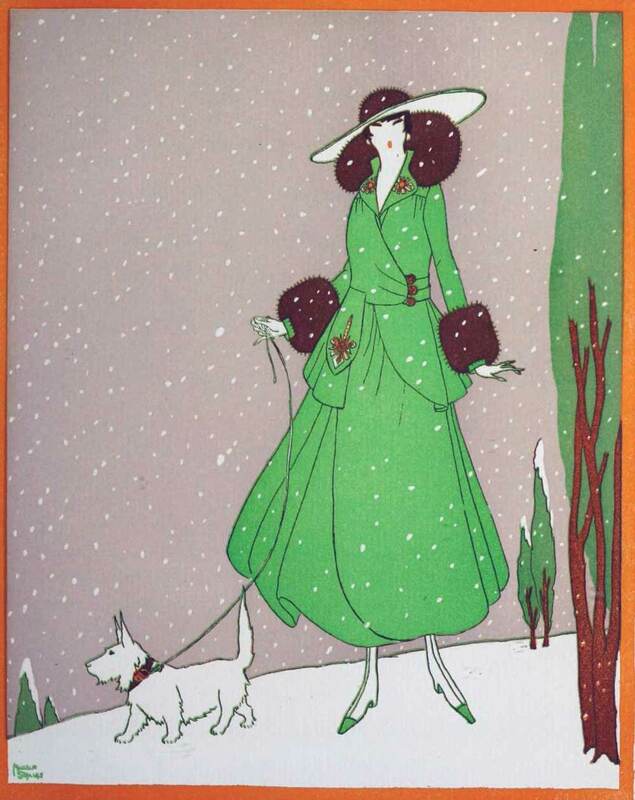 We shall see the gabardine coat with a short skirt, flying lightly at every step of the wearer, such is to be the morning costume of very elegant women. 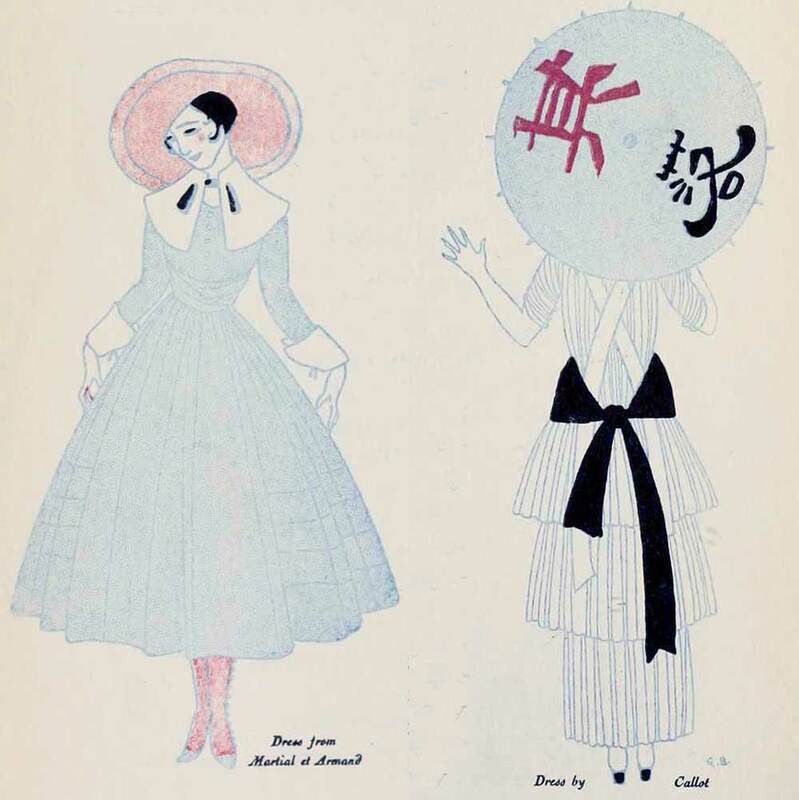 The waist will be long and without any curve, for the new oriental fashion encourages loose wraps, allowing much greater freedom. We are still seeing high collars but only at the back, and not the instruments of torture seen before. “Throat free” is the new mode except of course when adorning her scarf for the chilly winter months later on. In the shape of some morning frocks I noticed one in silvery light blue taffeta’s, quite plain;it had a marvelous effect with its “Franz Hals” collar, detached from the dress which was open at the shoulders. 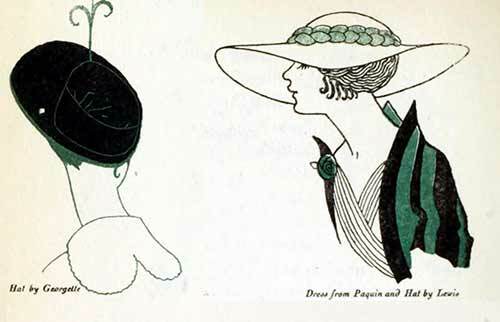 There is still attention paid to details such as blouses and trimmings, but this we insist on, they are the mark of refinement and elegance in the same way as under-garments now more visible than ever beneath short frocks. They are to be of silk muslin of one shade matching the footwear and stockings, and as numerous as the dresses. Until the very sunny days of July our hats will continue to be extremely small, their chief ornament being flowers. The three cornered hat is all the rage,the small supple boot with its moderate heels will give us the comforting impression that a lady can walk without fatigue, no longer perched on heels as high as stilts !